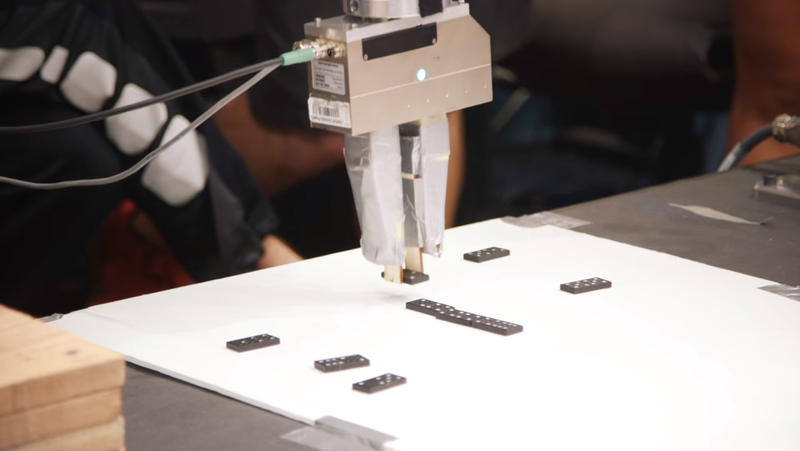 Stanford Students Build Robot Arms Capable of Playing Dominoes, the Xylophone « Adafruit Industries – Makers, hackers, artists, designers and engineers! There’s a whole division at Stanford focused on developing robotic arm operations. In the video below teams of students developed a couple applications, including a marker drawing robot, another capable of computer vision for playing dominoes (challenge accepted! ), and yet another for ‘listening’ to a musical score played by a human and playing it back. After learning new software and programming languages, Stanford students in the Artificial Intelligence Laboratory have an opportunity to choose a creative task and design a robot to perform the task for demonstration. The tasks call for a wide range of fundamental skills, but generally require the robot to sense where it is in space, detect objects around it, and then autonomously interact with those objects in its environment. Recent projects include dominoes, playing the xylophone, and sketching out an image.